We give several examples of modeling in nonlinear elasticity where a quasiconvexification procedure is needed. 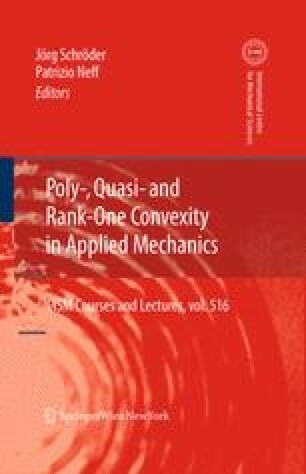 We first recall that the three-dimensional Saint Venant-Kirchhoff energy fails to be quasiconvex and that its quasiconvex envelope can be obtained by means of careful computations. Second, we turn to the mathematical derivation of slender structure models: an asymptotic procedure using T-convergence tools leads to models whose energy is quasiconvex by construction. Third, we construct an homogenized quasiconvex energy for square lattices.